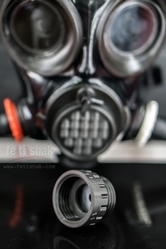 Fitting for junction of gas masks and accesories with NATO40 threads. Select desirable threads combination. F threads are freely rotable whic helps to screw fitting to devices/accessory. Colour of whole fitting is optionable. Screws are made from durable plastic.